I'm feeling very on top of things right now, because I just finished our Valentines nine days ahead of schedule. As in not seven hours before school starts on Valentine's Day. Whoo hoo! I'd like to kick back and bask in the glory and all that, but the real truth is that the only reason I am done with plenty of time to spare is because I'm avoiding some other very important things. Deadline looming like the Cloud of Death important things. I don't want to think about those things right now though. I don't want to harsh my mellow. 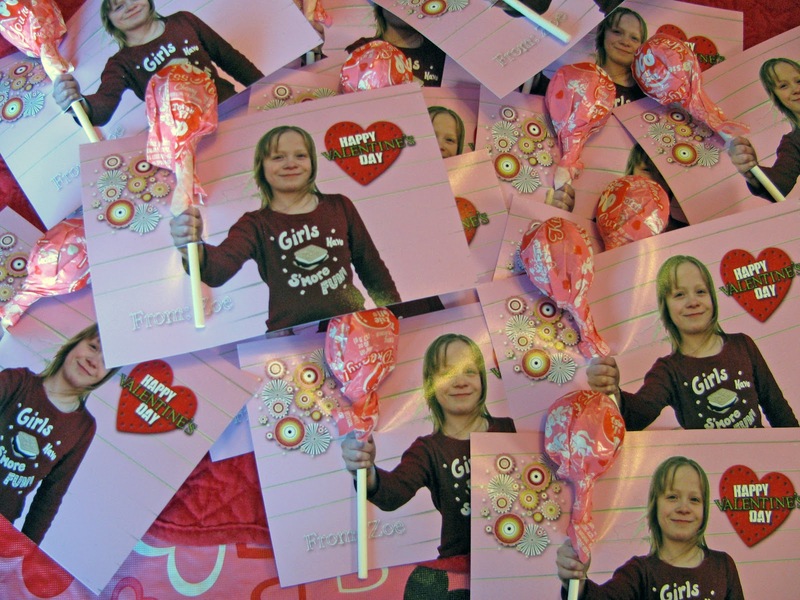 I've been itching to try these hand-my-friends-a-lollipop Valentines for a couple years now. I know that everyone and their brother is doing them, but they are so cute, so I'm copying. 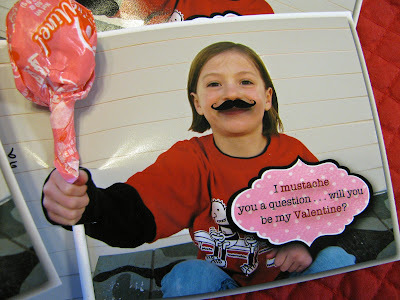 I've also been eyeing the cute "I mustache you a question" Valentines. I thought they would be perfect for Stinkerbell because she's so anti-girly. Sadly, she was not amused. I think she's warming up to them though. I told her that they're all the rage for boys this year. I don't think I've mentioned this, but she has completely banished anything remotely girly from her wardrobe. In fact, she insists that all of her clothes come from the boys' department. It has been unfolding in stages. It started when she was three and I unveiled her very girly flower room. That was when I learned that three is not too young to stick your fingers down your throat and pretend to violently vomit. You could say that there were early signs that we were in trouble. 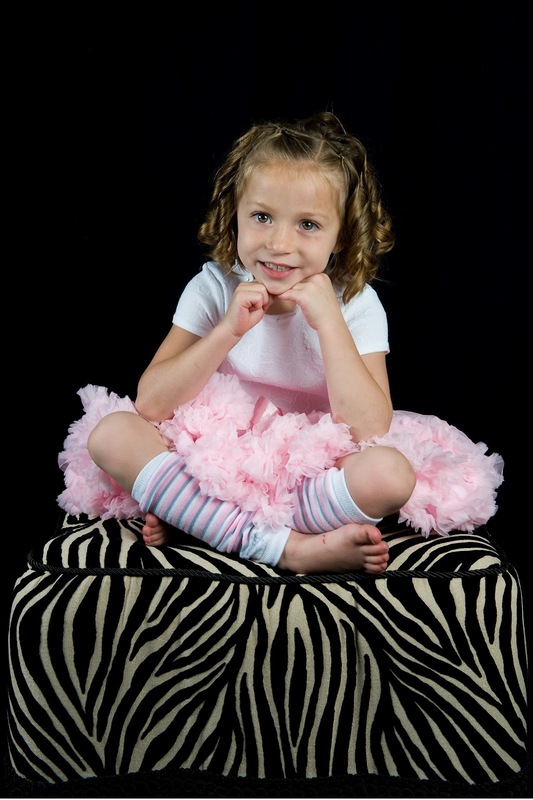 It has been a rough road for a Mama dressing vicariously through her children. My days of dressing my baby were numbered. It started out subtly. Like she wouldn't hug anyone that had buttons on their clothes. Then it expanded to jewels and bling. Then she wouldn't even play with Zoe Bug if she had glitter or bling on her clothes. Then she started wearing the clothes that she hated inside out, because we wouldn't let her go to school naked. In the end she showed us by passive aggressively wearing the clothes she hated without underwear. It has been one big, exhausting, exasperating, power struggle. I think it's a control thing. I have no idea where she gets it from, but this school year I finally gave up the fight. She wins. I lose. 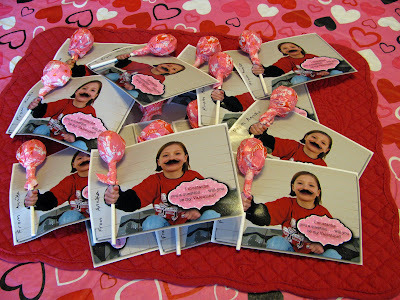 And because she gets her passive aggressive gene from me, her Valentines get a mustache. 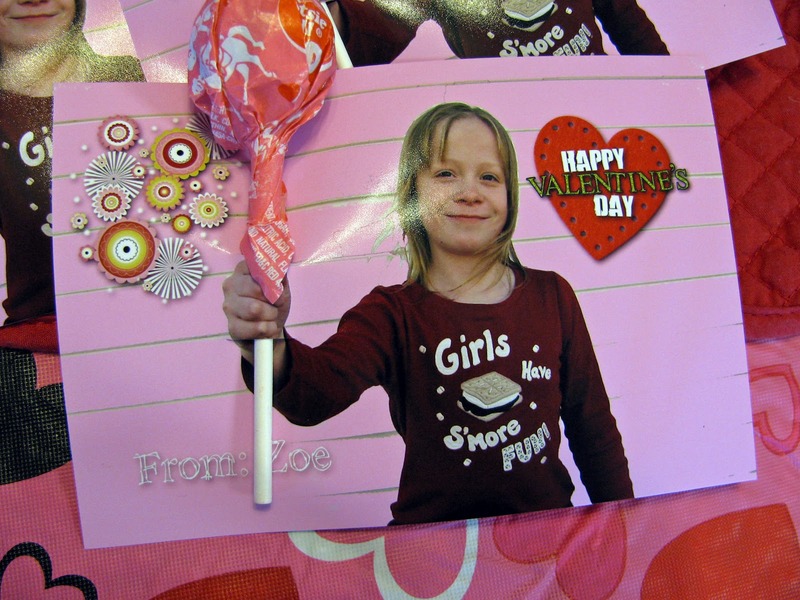 I made these Valentines for the monsters in my classroom. I heart them. You always have to qualify that statement when you're gushing over sixth graders, lest they be grossed out. 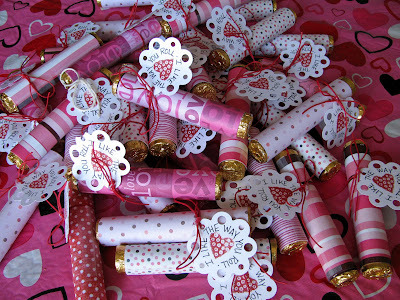 Just in case you can't tell, I wrapped Rolos in Valentine paper and added the little tag. 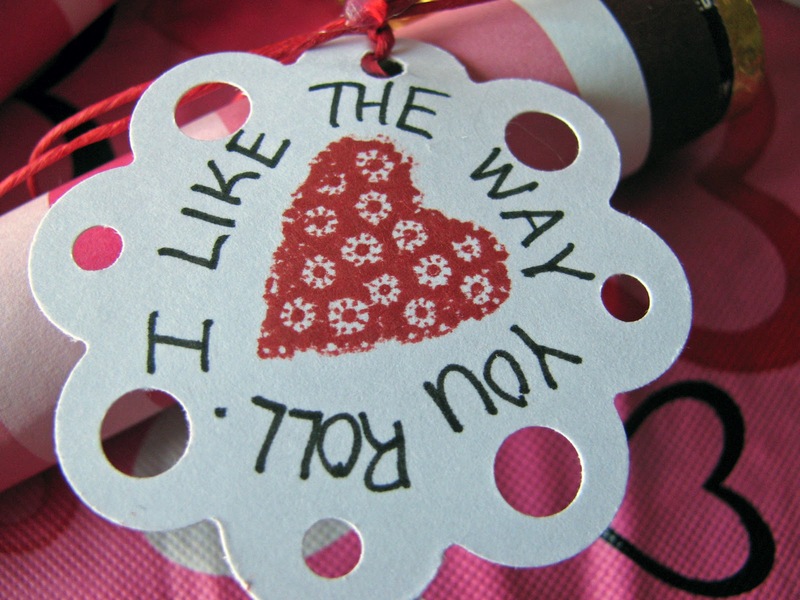 Another Pinterest inspired Valentine. 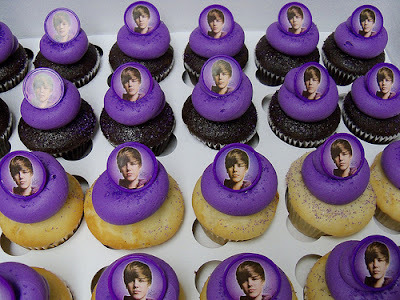 I'm going to share these Justin Bieber cupcakes with them tomorrow, on account of my birthday was yesterday and I believe in celebrating birthdays at school with cupcakes. I'm betting that they're going to take one look at the Bieber Heads and stick their fingers down their throats and pretend to violently vomit. I absolutely love those valentines. I think the boys might like the Justin Bieber cupcakes more than the girls, because they're all secretly jealous of his teenage swag. I love that you can laugh at your struggles. We all have them . . . you just point yours out with humor. and I feel for you about the anti-girly situation! The mustache fad is weird, I don't get it. As a fellow mother (that doesn't sound right for some reason) I applaud you for getting valentines done nine days ahead of time! And for your students to boot! If it's any consolation, my second daughter, now age 25, was very anti-girlie as a child. My older daughter loved Barbies and ponies but the second one loved Power Rangers and Teenage Mutant Ninja Turtles. I so hear you. But now that she's older she dresses very girlie. Too girlie. As in "I'm so sorry you couldn't afford to buy the bottom half of that dress, darling" girlie. As in "I don't care if you're 25 and live on your own, you are not leaving the house looking like...like...like...a GIRL!" Your dtr is a girl after my own heart. Love love love the pic of her playing with the soldiers. It used to frustrate me to no end that my brother got to be in Cub Scouts while I was supposed to be in Brownies. Brownies, really? Are you kidding me? I used to steal his manual and read all about how to start a campfire or how to build a survival fort out of pinetree branches in the woods. I am glad you stopped the power struggle and let her be who she wants to be! And PS: I have been happily married for going on 24 years and have 6 kids. My Cubscout lovin'-tree climbin' -Tomboy self did not turn out gay. Lucky you... our Valentine passing out days are over. Those ideas are cute!